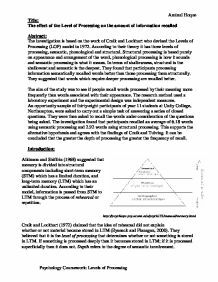 Title: The effect of the Level of Processing on the amount of information recalled Abstract: The investigation is based on the work of Craik and Lockhart who devised the Levels of Processing (LOP) model in 1972. According to their theory it has three levels of processing, semantic, phonological and structural. Structural processing is based purely on appearance and arrangement of the word, phonological processing is how it sounds and semantic processing is what it means. In terms of shallowness, structural is the shallowest and semantic is the deepest. They found that participants processing information semantically recalled words better than those processing them structurally. They suggested that words which require deeper processing are recalled better. The aim of the study was to see if people recall words processed by their meaning more frequently than words associated with their appearance. The research method used a laboratory experiment and the experimental design was independent measures. An opportunity sample of thirty-eight participants of year 11 students at Unity College, Northampton, were asked to carry out a simple task of answering a series of closed questions. They were then asked to recall the words under consideration of the questions being asked. 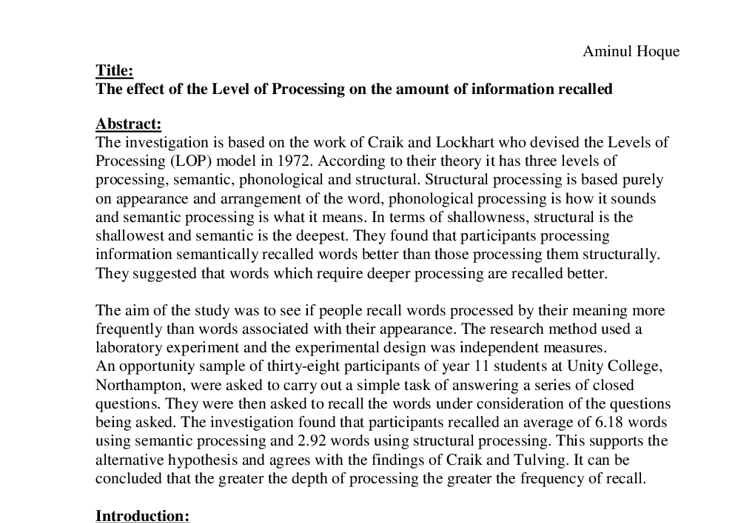 The investigation found that participants recalled an average of 6.18 words using semantic processing and 2.92 words using structural processing. This supports the alternative hypothesis and agrees with the findings of Craik and Tulving. It can be concluded that the greater the depth of processing the greater the frequency of recall. Introduction: Atkinson and Shiffrin (1968) suggested that memory is divided into structural components including short-term memory (STM) which has a limited duration, and long-term memory (LTM) which has an unlimited duration. According to their model, information is passed from STM to LTM through the process of rehearsal or repetition. http://psychlops.psy.uconn.edu/psych132/manual/memory.html Craik and Lockhart (1972) claimed that the idea of rehearsal did not explain whether or not material became stored in LTM (Eysenck and Flanagan, 2000). ...read more. Apparatus & Materials: The experiment required a set of question papers, consisting of 16 questions, of which 8 required semantic processing and 8 required structural processing. The use of capital letters, lower case letters and "yes" or "no" answers were equal, as to not influence recall in any way. Participants may recall words written in capital letters or answered YES better than those in lower case or answered NO, or vice-versa. A sample question paper can be found in appendix 1. The words selected were all nouns, and were between five letters and ten letters long, so recall would not be too difficult. The words were chosen using a random word list and could be used frequently in everyday language. All words had at least two syllables. On the question paper, participants were asked how a word looked. For example: "Is the word in capital letters?" The words assigned to these types of questions require use of structural processing. Other questions asked about whether or not the sentence made sense. "Does the word fit?" The words assigned to these types of questions required understanding what the word meant and using semantic processing. Two participants were used in a pilot study, they were asked to complete the question paper before the study was conducted for real in order to quash any ambiguities. Participants were timed using a stopwatch for 2 minutes to answer the paper and 2 minutes for recall of words. Standardised instructions (see appendix 4) and debrief (see appendix 5) was used. Procedure: Two classes of mixed ability were approached with permission of their tutors. Previously, consent from their parents had been acquired after a notice in the school newsletter was sent out to them, giving them the right to withdraw if they did not wish to take part. It was necessary to get parental consent as participants were under 16. (see appendix 7) ...read more. The results of the study could have been subject to unintentional bias. However, an improvement for next time is to use a double blind technique, where the collection of the data is carried out by a third party, so that neither participant nor person running the study is aware of what the expected results should be. Words which bore personal meaning to the participant and therefore made it easier for the participant to remember, would limit the findings of the study. There was no guarantee that all the words had no personal links to the participant, this may have affected results. The effect would be more frequent recall on those particular words, however this limitation could have been quashed by the use of abstract words. As an improvement, participants could have been tested in smaller groups so it was less likely that they would cheat by looking at each others paper. The sample size was rather small, a much larger sample taking in all age groups is needed to gain conclusive results. Socio-economic groups should be also assessed in order to have ecological validity. The findings can be related to everyday life as the results show the deeper the information is processed the more frequently it is recalled. This would be extremely helpful in revision techniques, drawing spider-diagrams to summarise notes, asking yourself questions about the topic, and explaining the topic to someone who knows nothing about it. It is important the material being explained is well understood in order for it to be conveyed to another in a way that they also understand it. Revisiting the same topic in a number of ways reinforces learning. Further research could be carried out to investigate whether participants recall of words increases more frequently after answering YES to a semantically processed answer rather than NO. Depth of processing or recall may be affected by positive responses. Conclusion: The study shows that words that required understanding the meaning in given questions (semantic processing) were more frequently recalled by participants than those associated with the appearance of the word (structural processing). ...read more. 4* An accurate and reasonably detailed demonstration of knowledge and showing an understanding of the research and its findings and limitations. Main recommendation is to ensure that discussion and evaluation are in the Discussion section. The issue of psychology as a science is cloudy. On the one hand, psychology is a science. The subject matter is behaviour, including mental aspects of behaviour such as memory, and the subject matter is divided up for study. Variables are measured, and carefully controlled to a point. This, it has been suggested, is similar to the nature of an emergency as both situations involve uncertainty, ambiguity and a lack of structure in terms of a proper basis for judgement or action. Palahniuk shows these men as gullible even as they try to kill their own leader because he had told them to do so. This shows that they just needed an ideal to follow, once Tyler/Joe had given them it they abandoned him just as they were abandoned. the unique aspects of one's culture, and is positively related to well-being. The 3rd life task is work and leisure, which is task-centred, and provides an opportunity for pleasurable experiences that are intrinsically satisfying, and provide a sense of accomplishment. 21 out of 22 obeyed the doctor's command. This was a field experiment and showed high ecological validity. The nurses were not aware that they were in an experiment and therefore could not have shown demand characteristics, and the obedience rate was still extremely high. a man wasn't matched up with a woman who was taller than him. Each person was then asked to rate their partner and it was found that the more attractive individuals were the best date that doesn't support the Matching Hypothesis. By allowing the children to participate it may be found the transition to school will involve many feelings, such as loss and sadness at missing family or losing friends, or also feelings of happiness by making new friends and gaining more independence.